You are viewing Posts Tagged "notched sound therapy"
Step 3 Walkthrough from AudioNotch on Vimeo. 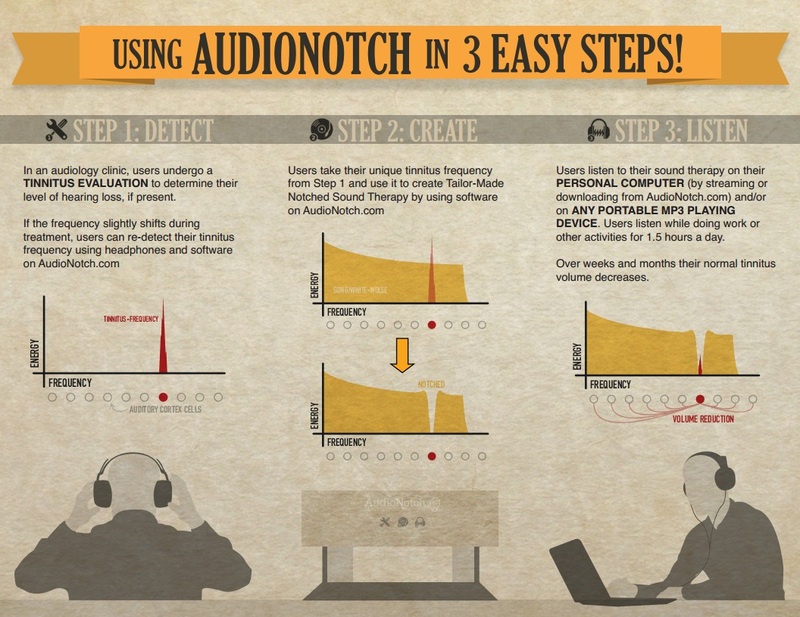 Step 2 Walkthrough from AudioNotch on Vimeo. Step 1 Walkthrough from AudioNotch on Vimeo. AudioNotch Mobile App Walkthrough from AudioNotch on Vimeo. Evidence for Notched Sound Therapy: Does it Actually Lower Tinnitus Volume? Notched Sound Therapy is an ongoing area of clinical research. With scientists examining its therapeutic potential in Germany, Italy, China and Korea, the research is occurring worldwide. Preliminary analysis of the effects of tailor-made notched music therapy on chronic idiopathic tinnitus. Notched Sound Therapy – How Strong is the Evidence, Really? For the average person with tinnitus, making sense of the scientific literature on treatments is a difficult task. Without having a background in statistics or the critical appraisal of scientific papers, it’s easy to be persuaded by the efficacy of a multitude of treatments. Navigating this space is made even more difficult by the fact that the internet is flooded with misinformation and marketing copy on treatments that are demonstrably useless. We understsand, however, that users want an unbiased view of how this therapy actually works and what the efficacy is. Is there such a thing as Sound Therapy Music for tinnitus? The term can be used interchangeably with “Notched Music,” “Notched Music Therapy,” and other terms. Originally discovered by Christo Pantev’s German lab, other experiments have shown efficacy with Notching other sounds as well, such as white noise. To read about the science behind Sound Therapy Music, click here.